This is a gourmet sausage roll in my eyes. It's filled with a delicious broccoli rabe and sausage filling to make this stuffed dough into a fabulous rolled sandwich baked to perfection! This has all the taste of a great sandwich of these greens with homemade sausage, cheeses, garlic and extra virgin olive oil flavors. Of course you can leave the meat out if your vegetarian, not a problem at all, still perfectly delicious! What is an Italian Sausage Stuffed Pizza Dough? Stuffed Pizza Dough is a perfect stuffed rolled pizza dough baked, sliced with everyrthing inside like a sandwich. It's tender part of the broccoli family. Sauteed Broccoli Rabe is delicious by itself, this is just another great way to eat it! Added minced garlic and olive oil to the pan and viola a banquet of fragrant Italian greens! This makes a delicious sandwich all in one rolled up glorious pizza dough. You can make a whole meal out of this. Add a antipasto and some good Chianti and you're good to go. I love to make my own pizza dough, it's mom's recipe. It always comes out light, delicious and perfect for all pizza and stuffed pizza dough. We also love to make garlic knots with the dough. Mom always made homemade sausage, homemade pizza dough and the broccoli rabe was sauteed perfectly. I will always look back and think of her when I make this. This Broccoli Rabe Sausage Roll is one of my all time favorite pizza rolls. Whether you make you own dough or buy the pizza dough, this is a very easy to follow recipe. One the dough is rolled out, add the filling, roll it up, let it rest with seam side down and bake it! Add a nice antipasto salad, make sure you have a good Traditional Sunday tomato sauce on the side for dipping the sliced pizza roll into and viola, you have the perfect dinner meal. Great for an afternoon lunch or brunch with a good Chianti. Well if your family doesn't like sausage or broccoli rabe, it's ok.
You can stuff you pizza dough however you like, this just happened to be my favorite one. Meatballs crushed, pepperoni or any other kinds of meat you like with shredded cheese will be the experiment recipe for you. All stuffed pizza rolls are wonderful, I love this stromboli recipe also! You can even make it all vegetarian, with spinach and ricotta cheese with shredded mozzarella like a calzone style. Here in Florida, we sell broccoli rabe year round. Hopefully you can find this tender Italian style broccoli. Mom boiled it to get the dirt left behind out first, then sauteed. She didn't purposely make it just for this pizza roll, Broccoli rabe is great in sandwiches on Italian crusty bread too. Don't worry if you didn't use it all up in the roll, you can also put on pasta with cooked sausage and tomato sauce, another delicious meal! If you decide to make this for your family and never had it, I would strongly suggest you make the broccoli rabe first, taste it and see if you like this delicious garlicky green. They are my all time favorite. You can also make a small open top regular pizza with broccoli rabe on top but I promise you, if you love greens and sausage, this is a winner meal! Stretch out dough with floured hands, rest for around two minutes to a 12 x 8 x 1/4 inch rectangle. Evenly spread on the dough broccoli rabe mixture, add mozzarella and grating cheese on top. Roll up like a jelly roll tight, pinching both ends together to seal. Place on oiled sheet of foil with 1 tablespoon of olive oil, then onto a cookie sheet and bake on a 400 degree oven till browned around 40 minutes. This looks absolutely wonderful my friend! This looks more like a Stromboli than Calzone but then again, I don't know all of the Italian terminology for recipes. I just downloaded SKYPE on my computer this morning. I still need a microphone and camera. You would be a great one to talk real time to! This reminds me of stromboli I think it's called. I used to make it often for my boys but haven't made one in a long while. Yours looks magnificent! I love broccoli rabe; the more garlic the better! Wrapping it up with sausage and mushrooms in a calzone? Fantastic combination! 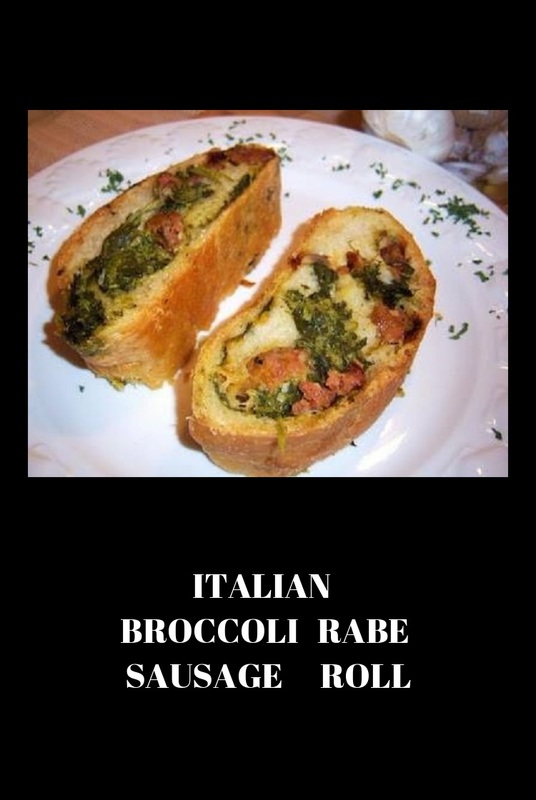 Wow, this stuffed roll sounds amazing with broccoli rabe and sausage, yum! What a special recipe and Calzone… I'd like to try it this weekend if I can. Wow, so want to make this. Great way to get some veggies into Alex. Do you think I could make it with just regular red wine or does it have to be marsala? Yum...dip it into some good sauce and call me happy! This looks great. I don't know if I've ever had Broccoli Rabe (or if I can find it where I live) Would this work with spinach? I love this idea though and want to give it a try! Broccoli rabe and sausage is a classic Italian combination, irresistible recipe! @gera great let me know how you like it! @tania thanks your a doll! What a good idea! What a great idea! Wait! Fantastic idea! I need to get some rapini today. You know how I love those veggies! My husband will have the sausage and I'll have the veggie version. Mouthwatering! Bread + things stuffed in bread = My idea of heaven. Oh yes. How lovely! LOVE broccoli rabe and with such a wonderful flavors with the cheese and the sausage and even on toast....HEAVENLY!!! Hey Claudia, I'm finally getting back after that traveling wedding weekend! I'm making stromboli tomorrow night. I have some greens and sausage in the freezer, will be trying this out, it sounds great. The only real difference between a calzone and a stromboli is that one is folded over into a big pocket, and the other is rolled, so it really doesn't matter what you choose to call it- especially when it's filled with a great flavor combination like Broccoli Rabe and Sausage. This sausage roll looks fabulous! Meat, veg, cheese and bread in every bite---so yummy!